Of Priceless Value Individuals are each of priceless value to God. He has a plan to destroy sin but save sinners. Paradise Lost The beginning of sin and the revealing of God's plan of redemption. Solving the Great Problem God's solution for the sin problem is revealed in an ancient sanctuary and its rituals as prescribed in the Bible. The Daily Services The daily rituals of the ancient sanctuary and their symbolic meaning. Jesus Revealed in the Sanctuary The detailed Bible description of the ancient sanctuary, with references to New Testament interpretations of the symbolism. The Lamb that Dies The death of a lamb in the sanctuary service symbolizes the atoning death of Christ. The Priest that Lives Applications of the symbolism of the ancient high priest to Jesus our high priest. At-one-ment The symbolic meaning of the ancient day of atonement in the ministry of Christ. Freedom from Sin The sacrifice symbolism, forgiveness of sin, and the true appropriate basis for keeping God's law. Shadows of Things to Come The symbolism of the seven annual religious ceremonies show God's plan for the total human experience. God's Love Revealed God's love revealed in the beauties of nature and more fully in the life and death of Christ. The Supreme Sacrifice God asks Abraham to kill his own son as a sacrifice. Why did God do that? Whispers of Love The Holiest Place of the ancient sanctuary as a source of grace for New Testament Christians. Why Three Places? The symbolism and meaning of the ancient sanctuary courtyard, holy place, and most holy place. The Bible Says Ancient and heavenly sanctuary questions with Bible answers. The 2300 Days The cleansing of the sanctuary predicted. What is the cleansing and what are the time periods mentioned? Hard Questions Answered Explanations of a few Bible points about which there have been disagreements. The Laws and the Covenants An explanation and comparison of the Ten Commandments with the laws of Moses, and the old covenant with the new covenant. The Law of Love An explanation of the Ten Commandments as a law of love. Facing Life's Record What the Bible says about the judgment and the time leading up to it plus where the second coming of Christ fits in. Cleansed and Renewed The new Jerusalem and the millennium. Together Forever Planning for a forever reunion with Jesus. 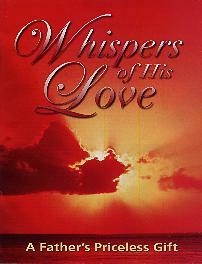 Note: The "Whispers of His Love" magazine in printed form is 32 pages, approx. 8" x 10.7". Web page created: 07/06/05 Updated: 01/10/06. Background courtesy of www.grsites.com.